While golf may be a sport many know about and how to play it, you’d assume, that again, I am none the wiser. Actually, that is not true in the slightest. It is a little known fact that baby Mady played golf for exactly one year in middle school. There are still bookoos of golf knowledge that I still didn’t know about. Go figure. I’m betting there is also some information that you might not know! Many of you might think you have the gist of golf from playing mini-golf at celebration station on the weekends, but there is more to this intense sport. “Yelling ‘fore’ and putts. That’s all that golf is,” said Jaci Wise. Well, miss Jaci, I hope you learn something from this article because golf is much more than that. The SNU’s Women and Men’s golf team are a group of dedicated and hardworking individuals who are looking to better themselves in this active sport. An interesting component of golf is that players play against themselves. They do score comparatively to others, but their competition doesn’t hinder their own score. It also doesn’t necessarily matter if you’re big or small. If you work hard and put in the effort, you can be a good golfer. Our golf team has had a great season, and both teams have three more games left including a conference. Emilee White, senior and craft lover, has been playing golf at SNU for her whole college career. She says she started to love golf when she realized how nice of a sport it was. She got to walk around outdoors and not have to worry about much while playing. Eventually, she became really good at it. How to play: The main goal of golf is to get the golf ball into the hole on the other side. Now obviously the game requires skill and technique to accomplish the goal. Lucky for you, I am here, and I have researched this extensively for you. There are 5 players from SNU that go to the Men’s or Women’s tournament. This is determined by playing three rounds and seeing which players qualify for the tournament. The game begins with a “tee time,” which is the time that the player will tee off from the tee box with their tee (and maybe some tea). The tee box is the place where the player stands to hit the ball for the first time. The player prepares to hit the ball by putting the tee (that little piece of wood) into the ground and then placing the golf ball on it. Typically, the player will do some sort of wiggle and a couple of practice swings before they hit the ball to prepare them for their swing. Afterwards, the player will shimmy on up to the ball and swing away. An important tip is to keep your head down looking at the ball while swinging. If the player misses (or whiffs) the ball, it still counts as a stroke. After hitting from the tee box, the player goes to their ball and tries to hit it into the green. 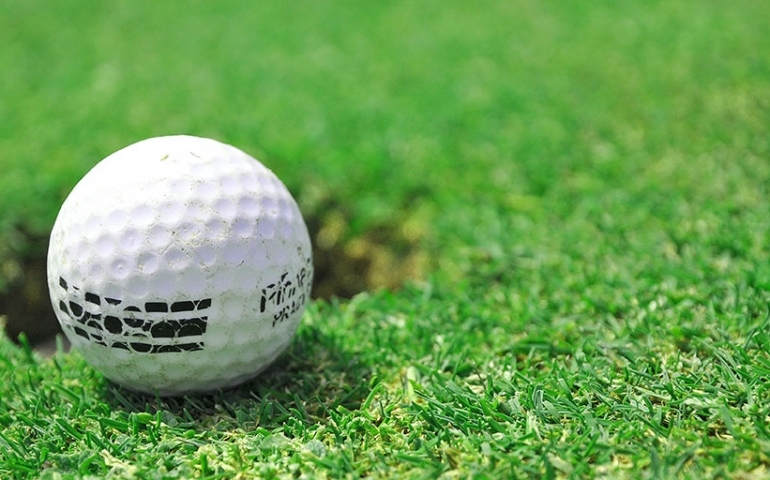 Try not to hit the golf ball into the water, sand trap or any other hazard because it is difficult to get the ball out. Once in the green, the player will take time to judge distance, elevation and other components of their short game putt. The “putt” happens on the “green.” It’s so much terminology, I know. Don’t worry. We will get through this together. The green is the highly mowed part where there are tiny baby blades of grass. There are multiple clubs that a player can hit the ball with. These include: Driver, wood, hybrid, iron, wedge and putter. College players are only allowed 14 clubs in their golf bag. How points are scored: It’s well known that in golf the lower the score the better. The score is determined by strokes. One stroke is one point. There are penalty strokes but that is a whole other kit and caboodle. Every player is trying to get “par,” which is the amount of strokes it takes to get the golf ball into the hole. Holes are typically par 3, 4, or 5. The courses are typically around par 72. So if a score is the amount of strokes and the player is trying to get par, then a good golf score is around 72. There is also fun terminology for scoring under or over par. If a player goes one under par, it’s a birdie. One over par, it’s a bogie. Two under par, it’s an eagle. However, you might’ve already known that from Wii golf. Golfers yell “fore” when they want to warn others that a golf ball might be hitting them in the near future. All in all, fun sport. If you want to enjoy a nice day in a well groomed lawn area, you might think to accompany the golf team on an outing. It’s a peaceful and relaxing way to spend a day, and there might even be some excitement like witnessing a hole-in-one. Make sure you wear sunscreen and some pastel colors if you do go. If not, go out and tell a golfer that you actually know how their sport is played, and give them a pat on the back for all their hard work!